I will be sampling some brand new VR beans at the "America Now" exhibit at the Smithsonian American Art Museum. Saturday, June 27; 5–8 p.m.
Eighth and F streets N.W. The most interesting to me here starts at the 4:11 mark. A woman repeatedly says the word "bar", but what you and I hear depends on how we see her lips moving. We could hear "far" or "var" if we see her lips saying that in the video, even if the audio track is saying "bar". This illusion is somehwat similar to what I'm exploring in this demo, but I believe this is just the tip of the iceberg when it comes to the new types of illusions and tricks that can be played on our brain when we are immersed in a virtual environment. I'll be doing some research, prototyping, and reporting my findings. You can modify the hologram shader with numbers (1-7) and keys (Q-U) on the top line of qwerty keyboards. Just got back from the Game Developer's Conference. I was blown away (as always) by the amazing people, overwhelming presence of VR on the expo floor, and overall good vibes. I'll be trying to sort through business cards get in touch with the folks I met at the conference. If we met, please get in touch! Crescent Bay demos blew my mind! Having had some difficulties porting a project built for Oculus to Google Cardboard (mostly because of PC -> mobile RAM differences), I had been thinking about how difficult it would be to support multiple input devices. Especially when nobody knows for sure which devices will become most popular. I heard about OSVR -- an open standard for virtual reality that gives developers a layer of abstraction between their code/game engine and the hardware. OSVR allows a developer to support many devices, without worrying about which device the user has. If your application tracks hand positions, OSVR will give you hand positions, whether that data comes from a Leap Motion, Kinect, or Razer Hydra. I think this is exactly what virtual reality needs right now, so I'm excited to start contributing to the project with the goal of everyone benefiting from better VR experiences. Global Game jam 2015 entry. Starflocks 64 is an 8-player multiplayer game about cooperating as a school of fish as you navigate the depths of the ocean in search of food and safety. It's been a busy month thus far. Working hard to get a demo ready for the IGDA Baltimore meeting. Also making changes to God of Battle Rave. We're trying to add a boss battle and improve the feel of the combat system. On top of all that... Ludum Dare 28 is this weekend! Not sure if I'll have the time to participate with so much going on. If I happen to come up with an idea that I think I can dissolve into an existing project, it's a go. Hopefully I have a new game to show by Sunday night. In the meantime, check out this great article by Technically Baltimore about BIG. God of Battle Rave will be showcased at the Windup Space on Wednesday, December 18th. The event starts at 8pm. Hope to see you there! One month is up. The Robot Dice Baltimore Indie Game Jam is complete. Play God of Battle Rave on the web. Here is a direct download if its taking a long time to load on the web. If you're lazy, here is a video. 3 Days remaining in the BIG Game Jam! Who's ready to Battle Rave? This guy. October 31, 2013 Happy Halloween! In my previous update I mentioned the Baltimore Indie Game Jam. I'd like to take a moment to explain what the Baltimore Indie Game Jam is all about. Over the last few months, I've been a very active member in a new community called Baltimore Indie Games (BIG). BIG is about growing the independent gaming culture in the Baltimore region. We're making a big push to create some original content and put ourselves on the map, starting with the first ever Baltimore Indie Game Jam. To stay updated on BIG and follow progress of all the games in the BIG Jam, go here: http://bmoreindiegames.tumblr.com/. Many of our basic mechanics are working and our team has found a good workflow. From here on out it's about gameplay, fun, and juice. Looking forward to the 1st ever BIG Game Jam this weekend! 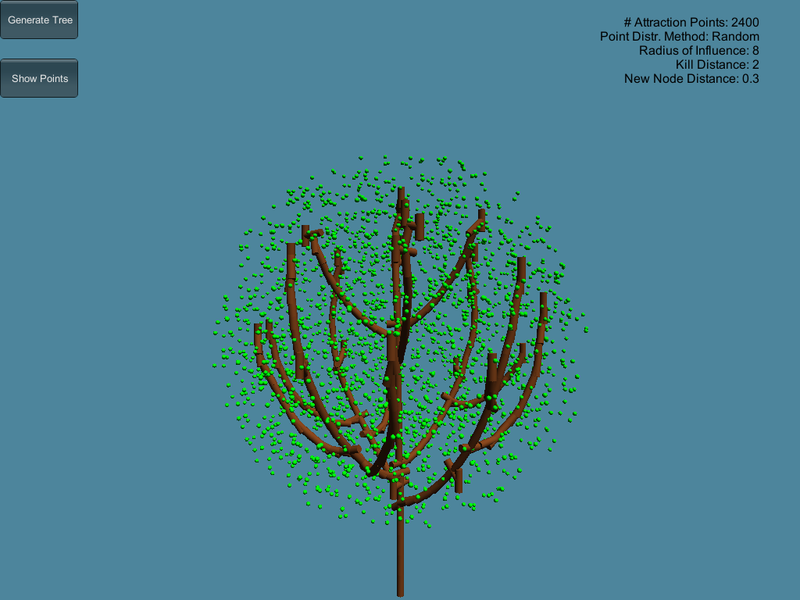 I have great interest in generating trees and vegetation in code at runtime. It is important that the trees branch out realistically, and that the size, shape, density, etc. is very customizable. My first shot at this is a very simplified implementation of the algorithm described in this paper. Here is a screenshot of my progress after day one. The green dots are not leaves, but attraction points as described in the algorithm. I think this is a promising start for this project. Full Album. Wait... what's going on here?? Something's gone terribly, terribly wrong. I'll have to sort this mess out. Some reflecting on this past weekend's development of Candelabra: link. Got my LD48 entry in just in time. My game is called Candelabra. Follow that link to find a Windows download. I will host a web build in the next few days. I am content with what I was able to create this weekend. It was an exhausting effort and a very weird project for me. I'm not sure if what I ended up with was what I had in mind from the start. '10 Seconds' was a fun theme to work with. It forced me to simplify my ideas, which is always a good thing. I'll be participating in my first Ludum Dare solo game dev competition this weekend. The theme has yet to be announced. All code and content must be created within 48 hours. My biggest concern is art. I'll have to make do with what I can do. Will post results. The last few months have been incredibly busy for me with client projects, moving, and a much needed vacation. It's been awhile since I've updated, so I wanted to write a short entry on my thoughts on the Oculus Rift. I haven't had as much time as I had hoped to develop something specifically for the rift. Working on a bunch of things, including a Kinect/Rift application where you can see your body in a virtual world. I'll have something to show soon. I did get a chance to port Love Bomb; it's interesting to fly through the circulatory system, but overall it needs some gameplay tweaks to make it a better Rift experience. I have had a chance to try some of the demos made by the Oculus developer community. Wow. There are some really stunning projects in the works. My favorite game so far is Proton Pulse. The Rift is going to change everything. You will be blown away by what you see and how you feel inside the Rift. We've received our Oculus Rift dev kit at Mosaic Learning. Now the fun begins. I've made some of our existing demos compatible with it. Very happy with the results so far. Oculus is going to change everything. April 11, 2013 - First update since attending the Game Developer's Conference. Had a great time. Tried the Oculus Rift. It's awesome and I CAN'T WAIT for the dev kit. Some developers I talked to were underwhelmed by the low resolution and latency. It's not that bad. WAY better than existing video glasses currently on the market. This is only a prototype version for developers, not the final product. The resolution and latency will improve. The only game they had to demo at GDC was Hawken. It was weird moving the mech's head with the joystick and also being able to look around inside the cockpit. I'm not going to judge the Oculus on the first AAA demo. We will see some really impressive, creative work when developers get their hands on the dev kit. January 27, 2013 - Global Game Jam 2013 complete! This year's theme was audio of a beating heart. Our game is called Love Bomb. Check it out -- right here. September 13, 2012 - Added a new page for my work with the Kinect. Made a new demo -- I wanted to control a model with the Kinect, and change textures on the fly. It's very simple and rough, but it works. July 26, 2012 - Sinc was featured in this Gamescape article. Check it out! July 25, 2012 - Sinc.